How to Quickly Escape a Car Sinking in Water. Every Second Counts. It only takes seconds and most people will never have to experience trying to escape a sinking car but it does happen. Whether it’s losing control of a vehicle or getting swept up in a flood, time is critical and experts state that you only have 30 seconds to get out safely. You may have seen the video of a woman and her dog swept up in the raging floodwaters in Baton Rouge, Lousiana, and thankfully help was available. A young man jumped into the water and helped pull the woman out safely. She realized her dog was still in the car but the man was also able to pull the dog out safely. Approximately 400 people drown every year from trying to escape their submerged vehicles. Experts urge people to immediately roll their windows down the instant they hit the water. This allows you to escape because the pressure of the water might prevent you from opening your doors. Rear passengers would also have to exit from these windows as most rear doors don’t allow windows to roll all the way down. What happens if you have electric windows? There are auto escape tools available in the event that the electronics fail underwater and you need to break your windows. ABC News demonstrates exactly what happens when cars start sinking and trained professionals showcase quick actions for getting out of your car. Time is of the essence and every second counts when it comes to escaping a sinking vehicle. 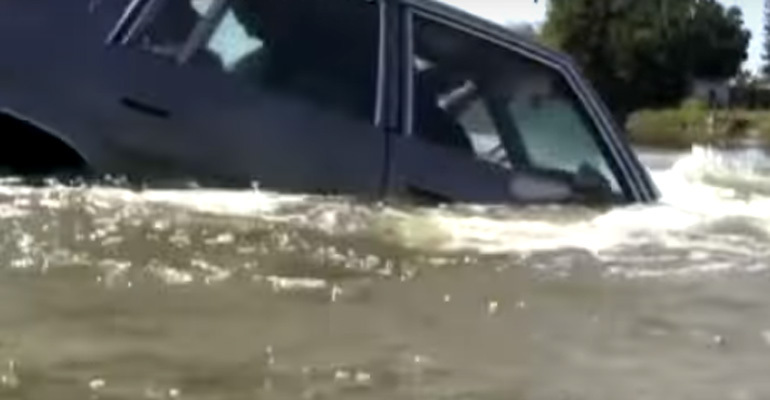 Please share this helpful video for learning how to get out of a sinking car with your friends and family.